Studies show that one way to get better sleep is to exercise before bed. There are several types of exercises you can do after a long day of work, starting from simple stretches to walking and jogging. Studies show that people who exercise before bedtime are more likely to get better sleep than people who do not exercise at all. Exercisers also tend to have better sleep with vigorous exercise, and are less likely to have difficulty falling asleep, waking up too early, or going back to sleep. In contrast, people who do not exercise are more likely to feel excessively sleepy during the day and to experience sleep apnea. Exercise before bed does not only give you a good night’s sleep, it also keeps you fit and tones your body. Many people do not have the time to go to the gym or spend some time during the day to exercise, but allowing some time to exercise before bed will help improve strength, endurance and muscle tone. Low to moderate exercises are generally recommended before bedtime. It is best to avoid too much exercise just before sleeping. Walking is a natural way to stay fit and healthy. It can be done indoors using a treadmill or outdoors if you prefer. Although this is an easy form of exercise, you must observe proper posture while walking. Keep your back straight and avoid leaning forward or backward. Keep your chin up while looking forward. Let your shoulders fall naturally and pull in your stomach. Start at an easy pace to warm up and avoid taking long strides. Beginners can start with 10-minute walks and gradually increase to 30 minutes daily. Jogging involves using different muscles than walking. It can be done indoors or outdoors, and it can be added to walking sessions. For beginners, alternate jogging with walking. You can jog for one minute then walk a little longer. 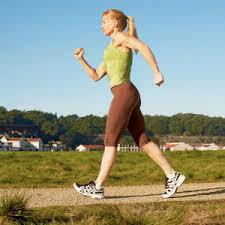 Start jogging at a slow pace and switch back and forth with a two-minute walks. Do this for 30 minutes. After warming up, stand with your feet shoulder-wide apart. Keep the back in neutral position, with your knees centered over the feet. Slowly bend knees, hips, and ankles, until you make a 90-degree angle. Breathe in as you lower your body. Now return to starting position while breathing out. For beginners, repeat 15-20 times, for 2-3 sets. Do this exercise 2-3 times a week. While lying on the floor, place your hands at your sides or behind your head. Lift your knees in toward your chest until they are bent 90 degrees, with your feet together or crossed. Contract your abs to curl your hips off the floor, lifting your legs up towards the ceiling. Lower the legs and repeat for one to three sets of 12-16 reps. This can be done with your legs spread wide or kept together. Let your heels lie flat on the floor. Fold your upper body at the hips with knees slightly bent, then reach to the ground as you pull your head down and stretch your leg muscles. When you are already flexible, reach for your heels through the legs. You can also try bending your arms at the elbows and stretch deeper. Lie on the floor with your legs at a 90-degree angle leaning against a wall. Keep your arms at your sides and close your eyes. Breathe deeply for 3-5 minutes. Begin on all fours with arms directly below the shoulders, knees under the hips and toes pointed to the ground. Bend your back towards the ceiling and draw your neck down while looking at the floor. Stay in this position for a few seconds. Now arch your back, pulling your neck up to look forward. Do these stretches to loosen the spine and neck. Lunge forward with one leg, keeping the other leg straight with the foot pointing to the side. Bend the forward leg at a 90-degree angle with the foot pointing forward. Now raise your arms while stretching your hip muscles and upper leg muscles. Make six long breaths while allowing your stretch to go deeper. Switch legs and repeat. While lying on your back, put together the soles of your feet. Hold out your arms at a 45-degree angle at your sides. Breathe deeply then let your knees fall to the floor while stretching the groin muscles and relaxing the body. Lie for three to five minutes as long as you are comfortable in this position. Research supports nighttime sweat sessions. One study shows that lung function, muscle strength, and pain tolerance peak between 2 to 6 p.m. However, the bottom line is that you will benefit from exercising any time of the day. Exercise any time of the day is beneficial to sleep, and at the same time helpful in keeping a healthy body. However, excessive exercise before bed may not be helpful and one should keep things in proper perspective. The National Sleep Foundation also warns that one should not exercise the expense of adequate sleep. How Many Calories Do You Burn by Swimming? Will Exercise Affect Blood Pressure?